Yep, there’s another change coming to Facebook, and it’s a big one. Starting Thursday, Facebook will begin turning on the new “Timeline” feature, which takes all your Facebook posts, photos, and miscellaneous “life events” and weaves them into a visual, linear, and (potentially) very public story. Like so many things on Facebook, “Timeline” isn’t optional—and indeed, it’ll radically change the way your Facebook wall looks and feels. The good news, at least, is that you’ll have at least a week to get used to your new timeline before it goes public, as well as tweak, hide, or even delete any chapters in your life that you’d rather not relive. 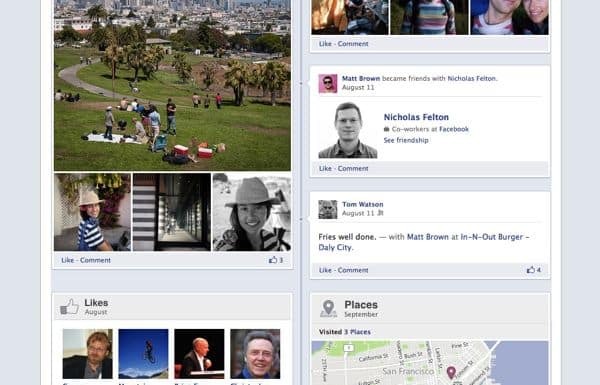 Your (soon-to-be) new Facebook profile, complete with the jumbo "cover photo." 1. What is Timeline, anyway? The Timeline sits just to the right of your big “cover photo,” and it is what it says: an expandable timeline of years, months, and days. Click a year and a month, and your Facebook page will jump down to that point in your “timeline,” displaying all your Facebook posts, photos, events, and other activity during that period. 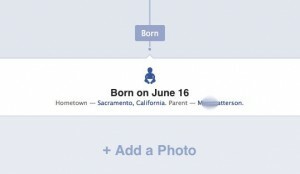 If you visit your Facebook profile right now, you’ll probably see your old Facebook wall, more or less unchanged. That’s a relief, right? Sooner or later, though, someone at Facebook HQ will pull the magic switch, and your profile will be “Timeline-ized” whether you like it or not. You can review all the events in your Timeline using the new "Activity Log," which only you can see. 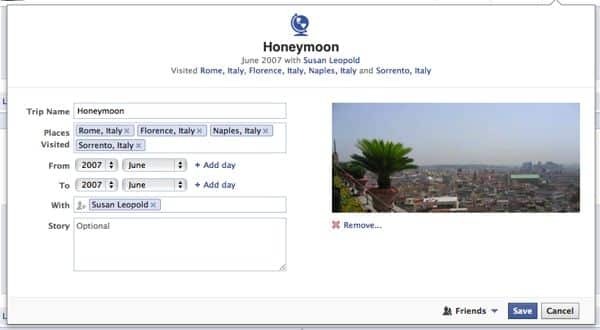 Facebook will give you a seven-day “review period” before publishing your Timeline to the world. That means you’ve got a week to scour your Timeline, check the events that are listed, pick over the privacy settings for each event (just click one of those little privacy icons to make a change), or delete any events that you’d rather not see listed. 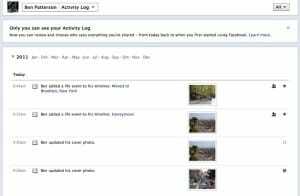 One handy feature for reviewing your timeline is the “Activity Log,” a for-your-eyes-only listing of any and all Facebook posts relating to you. 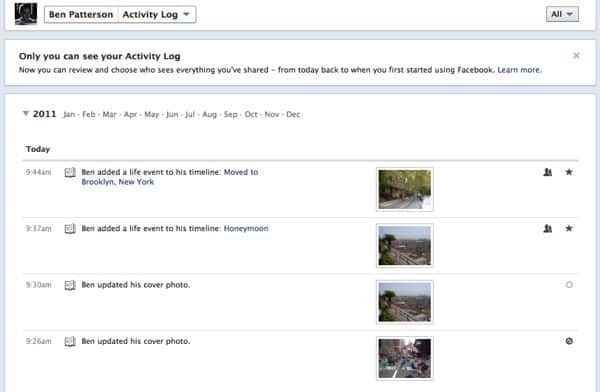 From the Activity Log (which you can access by clicking the “Activity Log” button just below your cover photo), you can see the privacy settings for each event on your Timeline, as well as “star” any important events (like a wedding or a new job) that you want to feature, or delete anything you’d rather forget. A week after Timeline is switched on for your account, Facebook will push it live whether you’ve reviewed your events or not. You can go ahead and click the “Publish Now” button if you’re ready to go. 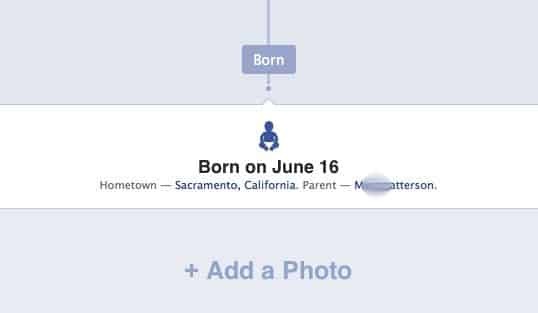 Nothing much about the prying eyes of Facebook surprises me anymore, but I was a bit stunned (and a tad creeped out) to turn back the pages on my new Timeline and find the following (and very first) entry: “Born on June 16,” complete with an icon of a little baby. Indeed, Facebook went ahead and added entries for my first day of high school, my college graduation, and even my first job—events, of course, that pre-dated Facebook itself. Again, you’re free to delete these “life events” and any others from your timeline. On the other hand, you’re also free to festoon these events with photos, comments, “likes,” you name it. You know those folks on Facebook who love to post updates about every little thing, from what they had for breakfast to freshly-printed sonograms? Well, for them—and even you or me, potentially—Timeline is sure to inspire a whole new level of oversharing. That’s partly because of the new “Life Event” button, which lets you add important (or not-so-important) milestones in your life to your timeline in just a few clicks. You can add "life events" for just about anything, from weddings to what you had for breakfast. Just click the “Life Event” button, select a category (from “Work & Education” to “Travel & Experiences”) and pick an event—and we’re talking everything from “New job” and “New child” to “Weight loss,” “Quit a habit,” “Got glasses,” “Took up a hobby,” “First kiss,” “Changed beliefs,” “Bought a car,” and … well, pretty much anything you can imagine. Once you create a new “Life Event” for yourself, you can add a location, tag the people you were with, mark the exact date, upload a photo, and even write up a quick summary of what happened. You can also create custom events for absolutely anything you want—including, indeed, what cereal you had this morning, along with what it looked like, who you ate it with, and whether you liked it. Just below your cover photo and immediately to the right of the “Activity Log” button, there’s a small gear-shaped icon; click it and select “View as” to see your timeline as others see it, including any specific friends or the public at large. As I mentioned above, Timeline is one of those Facebook features like those “Highlights” in the updated News Feed, or the much-hated “ticker” in the upper-right corner of every Facebook page—that is, you can’t just turn it off or revert to the old look. Or at least, not yet. So, what do you think of Timeline—love it? Hate it? Just wish Facebook would stop changing things? Let me know!